Two years ago, when we were going gluten-free out of fear that the fella may have inherited his mom’s celiac disease, we also happened to be staying here in NYC for the holidays. I tried to bring as much Christmas spirit into the apartment as I knew how — surprised him with a decked-out tree, bought some baubles, and tried my hand at gluten-free, dark chocolate peanut butter blossoms. Did you know you can make cookies without flour? Any flour at all? And that they will just melt in your mouth? It’s a thing, and they’re amazing. You could probably call these peanut butter meltaways. Two years later and with wheat flour once again a very prominent feature in our lives, I’m still making them. Here’s the thing: this is a one-bowl cookie. You just need a jar of peanut butter, sugar, baking powder, and an egg. That’s it. And then dark chocolate Hershey’s Kisses to make it into the perfect blossom, of course. No electric anything required. Just a bowl, a spoon, and your own two hands. 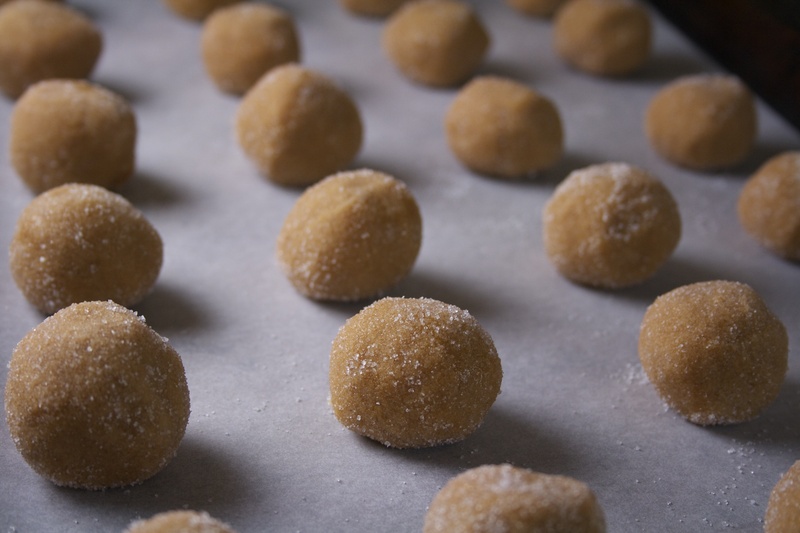 After mixing together your ingredients, the dough is scooped by the tablespoonful, rolled into balls, and then tossed in sugar. 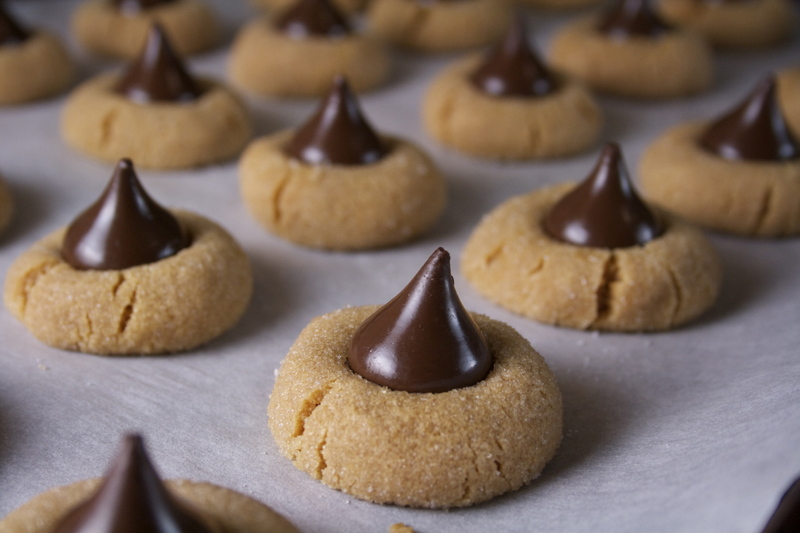 I bake them for eight minutes, unwrapping my Kisses in rows while the cookies are in the oven. 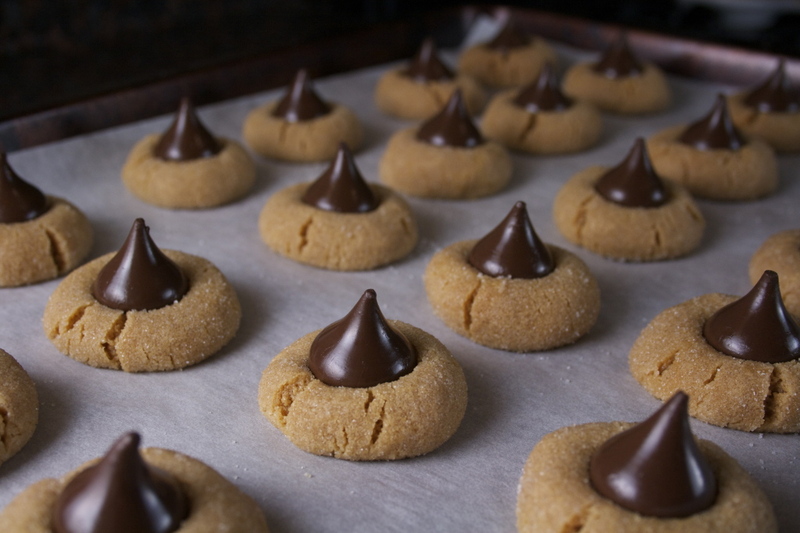 Then here’s the trick: at this point I take the baking sheet out of the oven and nestle the Kisses into each soft morsel before sending them back into the oven for two more minutes. The dough settles with each Kiss but still acts like a pillow, slightly cracking here and there like wet sand just starting to dry in the sun after high tide. So why the extra step? Why not just throw those Kisses on at the end after baking completely? Well, have you ever noticed that with some blossoms, the Kiss just sits on top, sort of like a hard hat? What’s the fun of eating a cookie if half of it falls onto the floor? Baking it for the extra two minutes melds the the two parts together to make one whole. 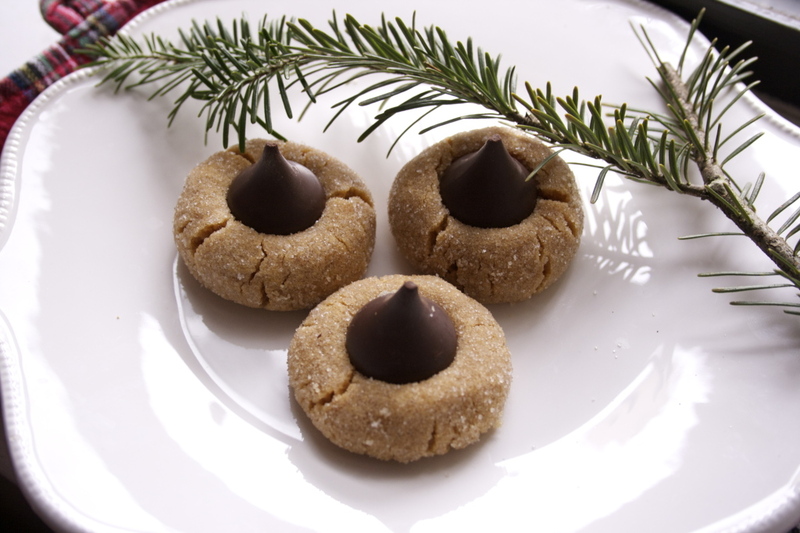 With these, the Kiss is still soft and still melts into the little nest of peanut butter like a true amalgam even days later. I’ll still take a glutenous, straight-up crumbly peanut butter cookie any day, but this season is special. There’s something about the texture of this flourless peanut butter cookie that compliments the chunk of chocolate to a tee. It’s that balance thing I’m always talking about, and it’s important for texture, too. And sure, you can use the regular ol’ milk chocolate Kisses, for old time’s sake, but take it from me, the dark chocolate is a perfect match with the salty sweetness of the peanut butter. 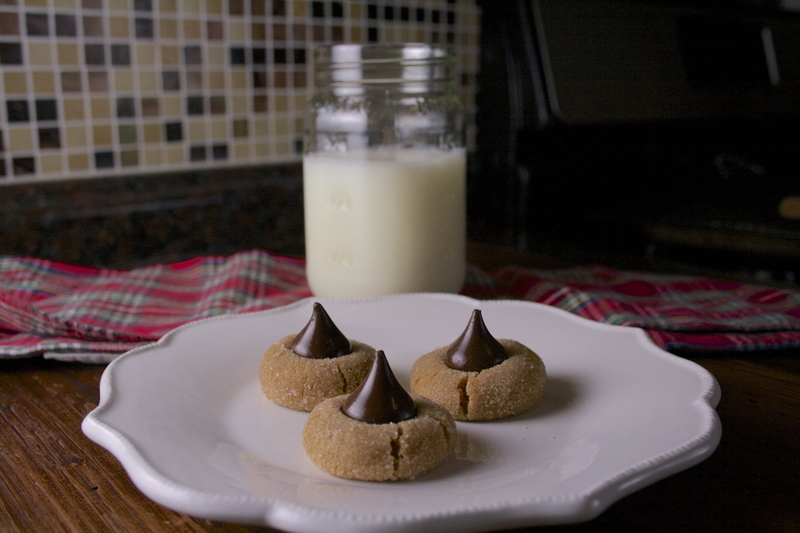 Let’s take our first steps into the holiday season with these little gems, let them be a bridge for gluten-free and non-gluten-free loved ones to come together. You don’t need to sacrifice anything for a flourless cookie. Instead you’ll gain a following. This might be the only time I’ll use an old standby peanut butter for a recipe. You may still be able to use a pure, oil-on-top peanut butter, but I haven’t tried and make no promises. 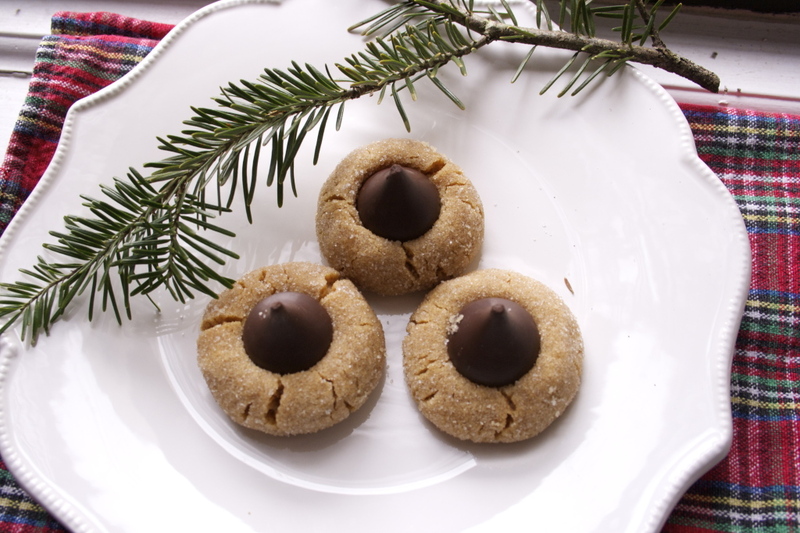 I have a feeling there’s something about the processed peanut butters that help the cookies to hold their shape. I still go natural, but not freshly-ground natural. I’ve also found that creamy peanut butter is the best choice for these guys. 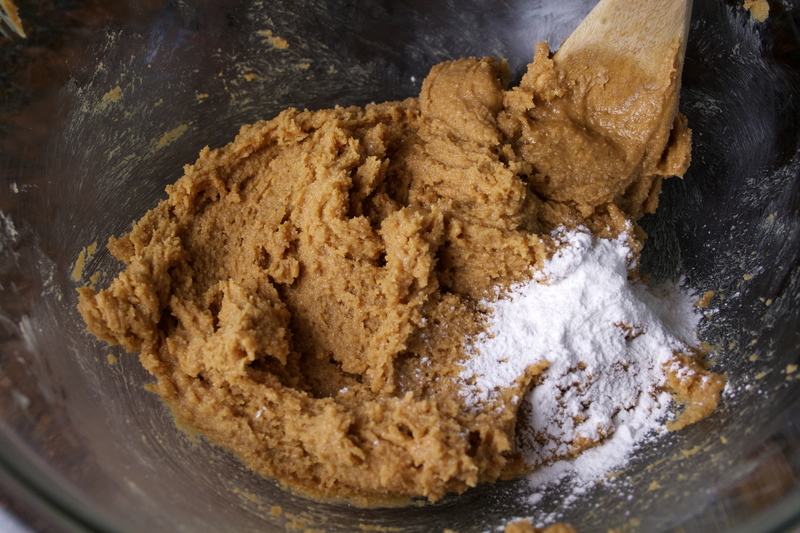 Save the chunky for your plain peanut butter cookies with flour. Give these babies a chance to melt. 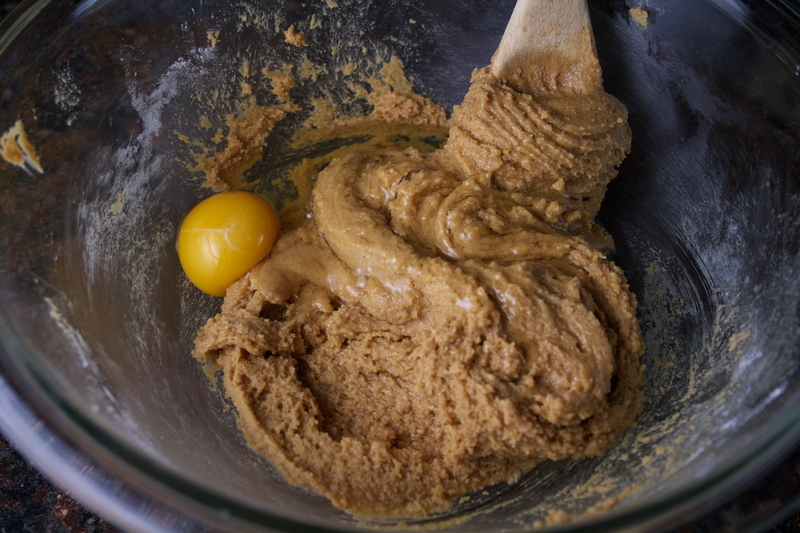 In a large bowl, cream the peanut butter and sugar with a spoon. Add the baking powder. Beat in egg, and mix until combined. 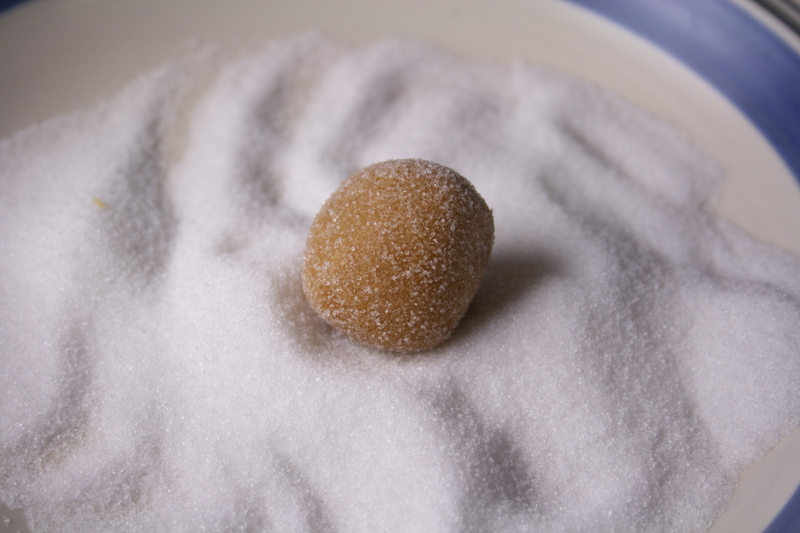 Fill a shallow bowl or plate with sugar. Scoop up dough with a tablespoon, and roll with the palms of your hands until round. Roll in sugar and place them, evenly spaced, on baking sheet. You should get about 24 cookies. Bake for 8 minutes. In the meantime, unwrap your Kisses and have them ready. 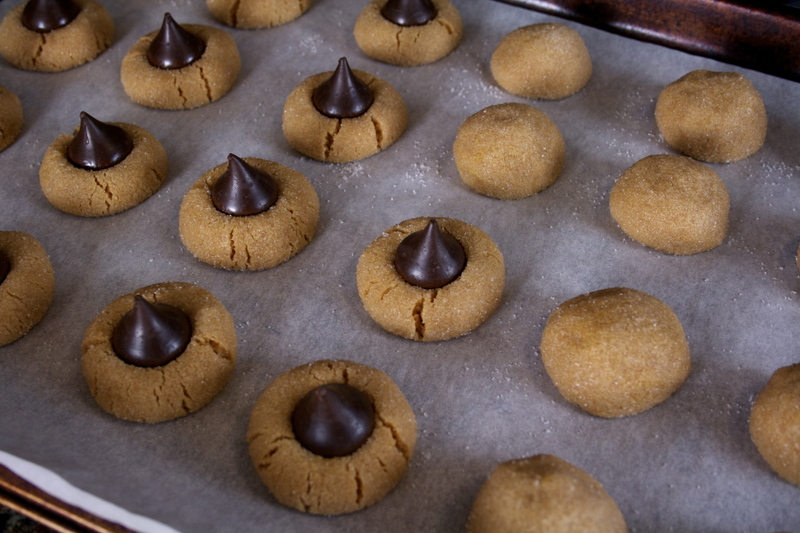 After the 8 minutes, take the baking sheet out and carefully nestle a kiss in the center of each cookie, pressing slightly. The cookies may break apart a bit at the edges, but that’s okay, because they’re peanut butter cookies, and that’s what they do. Place the baking sheet back in the oven for 2 more minutes. Once they’re out of the oven, let the cookies sit on the baking sheet for at least 5 minutes until they’re set enough to move onto a cooling rack. Let them cool slightly before enjoying. These cookies keep well in an airtight container.